A look at the top of the overall league standings today reveals an odd quirk: a six-way tie for first place overall, with three of the four divisions featuring a pair of 34-point teams. In the Atlantic, those two teams are the Canadiens and the Lightning, who’ve essentially owned the division since the season began. We’re all still waiting for the Bruins to eventually join the party, but for now it’s the Red Wings who’ve moved into the third spot, just a point behind. In the Central, the Blues still can’t shake the surprising Predators, who’ve won four straight. Those two teams will face each other on Thursday, and each also gets a game with the surging Blackhawks this week. And then there’s the Metro, where the Islanders have caught up to the Penguins thanks to a league-leading 17 wins, which marks the best start in franchise history. As for the Pacific, they just can’t keep up with the rest of the league. That division also features a tie for top spot, but the Ducks and Canucks are stalled at a measly 33 points. Slackers. Add it all up and you’ve got nine teams — 30 percent of the league — within a point of first place overall. If you’re a fan of parity, you love the look of the standings right now. If you have to put together a top five out of this mess, not so much. Let’s head to the next section and try to sort it out. 5. Nashville Predators (16-5-2, plus-18): I keep waiting for them to fade; they keep winning. Granted, this week’s narrow victories over the Oilers and Blue Jackets aren’t exactly anything to brag about, but wins are wins. 4. Tampa Bay Lightning (16-6-2, plus-21): They’ve won three in a row, Victor Hedman is back, and now the schedule serves up five teams with losing records over their next seven games. 3. Chicago Blackhawks (15-8-1, plus-26): Wait, how did a 31-point team sneak in here? The record still doesn’t look all that impressive, but a pair of weekend road wins over the Ducks and Kings sure did, so they’re in. 2. 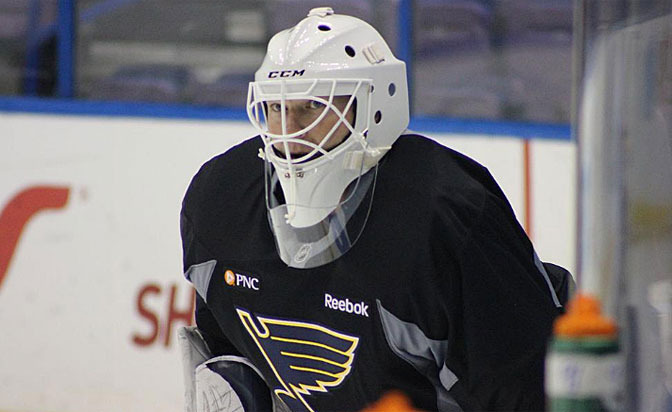 St. Louis Blues (16-6-2, plus-15): Martin Brodeur in a Blues uniform will take some getting used to. But hey, bringing in a goaltender who lost out to Roberto Luongo at the 2010 Olympics worked out great the last time St. Louis tried it, right? 1. Pittsburgh Penguins (16-5-2, plus-26): The Pens hold on to the top spot for one more week, but the grip is tenuous; they barely managed a weekend split against the Hurricanes. Well, that was a mess. We ended up leaving out two of the 34-point teams, as well as all three of the 33-point squads. The Pacific Division gets shut out completely, while the Central manages to squeeze in three teams. Meanwhile, Islanders fans won’t be happy about their omission, but I just don’t see anyone on the list that they’re clearly better than. As for Montreal, no team that drops back-to-back games to the Sabres gets to be in the top five, according to a new rule that I just made up and will probably forget immediately. 5. Philadelphia Flyers (8-12-3, minus-13): Their blue line is a mess, which means that their hopes often rest on Steve Mason standing on his head. That’s, uh, probably not a great plan. 4. Carolina Hurricanes (7-13-3, minus-14): They’ve won only one of their last five, although that one came on the road against the Penguins on Friday. One piece of good news: Jordan Staal sounds like he’s ahead of schedule. 3. Columbus Blue Jackets (6-15-2, minus-31): They’ve lost six straight and are alone in last place overall, so this ranking may actually be generous. And now they’re dealing with another long-term injury to a key player, with news breaking this morning that Artem Anisimov could miss three months. 2. Edmonton Oilers (6-14-4, minus-28): The losing streak is now up to nine games and counting, and calls for radical changes to the roster or front office (or both) are getting louder. They at least looked respectable against the Predators and Blues, but at this point it’s hard to get excited about moral victories. 1. Buffalo Sabres (8-14-2, minus-33): Back-to-back weekend wins over the Habs. Five wins in their last six. A recent five-game stretch in which they didn’t allow more than two goals in any game. The once unstoppable Buffalo Sabres tank has clearly run off the road. This week brings a home-and-home against the Lightning; if they can pry some points out of those games, we’re probably looking at a new no. 1 next week. The bottom five ends up being a lot easier to sort out than the top, thanks to the presence of five teams with point totals still stuck in the teens. Three of those are from the Metro and four are from the East, which is about what you’d expect given the talent gap between the two conferences. After all, even the lowly Oilers have been pretty good against the East, gong 6-3-1 in interconference games. It’s been a different story against the West, where Edmonton is a ridiculous 0-for-14. That’s not great news, considering each of their next six is against the West. • The Senators lost a pair of games in the state of Florida, and after a promising start they’ve now dropped to seventh in the Atlantic. They give up a ton of shots and have been surviving based on excellent goaltending; if the goalies cool off even slightly, this is a team that could plummet. • The Leafs earned a 6-2 win over the Capitals in a chippy Saturday-night game that featured a questionable Alexander Ovechkin hit and a linesman taking a punch to the face. • It was a busy weekend for the Canadiens. In addition to being swept by the Sabres, they also locked up Brendan Gallagher with a six-year, $22.5 million extension. • Also signing an extension was Wild defenseman Marco Scandella. He gets five years and $20 million. He also scored an OT winner against the Stars on Friday, then followed that up with a questionable hit on Saturday. • Speaking of the Stars, they lost a pair of divisional matchups to kill any momentum from a recent three-game win streak. They followed Friday’s 5-4 overtime loss to the Wild with a 5-2 loss to Colorado in a showdown between the Central’s two worst teams. • Buffalo’s Tyler Ennis had the goal of the weekend. The upside-down celebration was a nice touch. • The Red Wings have won four straight, including yesterday’s impressive win over the Canucks, and have scored 18 goals over that span. Now they just need to figure out how to keep the lights on. • The Sharks beat the Ducks 6-4 in an entertaining game on Saturday. The win may have saved Todd McLellan’s job, at least temporarily, as talk of him being in jeopardy had increased in recent days. • Finally, take a moment to enjoy a pair of nice tributes to Pat Quinn: one from the Canucks, and another from the Maple Leafs.